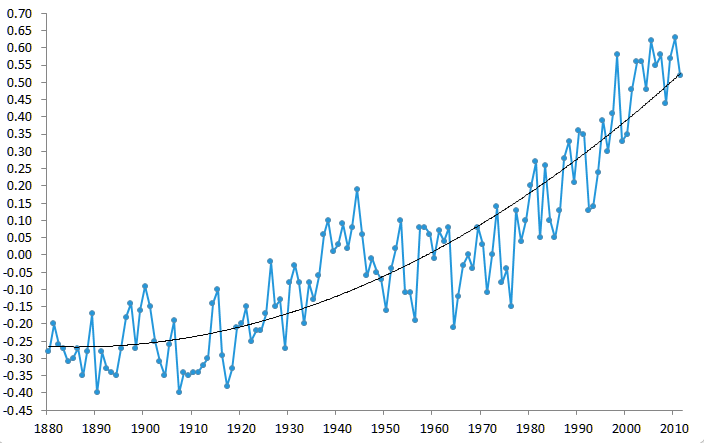 This increase in global temperature will have far-reaching impacts, including an increase in sea level which will threaten coastal and low lying areas, disruption of precipitation patterns around the world, and an increase in the frequency of extreme weather events and heat waves. These impacts will lead to further downstream consequences including species extinction, loss of ecosystems, and the loss of small island states. This article will shed some light on the science behind climate change and its expected impacts. The article will also highlight global and local action taken to mitigate climate change. Future features in the Road to Doha project will focus on climate change in the context of the Middle East and North Africa, and will detail the specific impacts on the region, its role is mitigating climate change, and adaptation opportunities. Following years of research, the entire body of climate scientists is almost in complete agreement that global climate change is happening, that it is caused by the increase concentration of greenhouse gases in the atmosphere, and that human induced (or anthropogenic) emissions are the largest contributor to this phenomenon. Greenhouse gases (GHGs) are a group of gases that are characterized by their ability to trap radiation as it attempts to leave the earth’s atmosphere. The main GHGs in the Earth’s atmosphere are water vapor, carbon dioxide, methane, nitrous oxide, and ozone. Normally, these gases play a positive role in regulating the surface temperature of the planet and making it livable. It is estimated that without these gases our earth would, on average, be 33 °C cooler (Figure 2). However, the increased concentration of these gases caused mainly by burning of fossil fuels is amplifying the natural warming effect and leading to an observed increase in global temperature. Greenhouse gases vary in their capacity to absorb energy in the atmosphere, also known as their global warming potential (GWP). While one molecule of carbon dioxide (CO2), the predominant of all GHGs, has a global warming potential of 1 GWP, other gases have a much higher global warming potential. A molecule of methane, example, has a GWP of 72 over 20 years, while a molecule of nitrous oxide has a GWP of 289 over the same period. Yet given the enormous quantities of carbon dioxide emitted into the atmosphere, its overall warming contribution is far greater than any other GHG. As a result, most estimates of GHGs are aggregated and expressed as carbon dioxide equivalents (CO2e ) to ease comparisons and put numbers in perspective. It is estimated that the concentration of carbon dioxide equivalents in the atmosphere have increased from their pre-industrial average of 280 particles per million (ppm) to more than 390 ppm today. With both the worst case and the best case scenarios forecasting a temperature increase, scientists have confirmed that some form of climate change is inevitable. They argued, however, that we need to limit the increase in global surface temperature to 2°C to avoid the worst of climate change. To ensure this, the world needs to collectively halve its 1990 emissions levels by the year 2050. This target appears hard to achieve given that total GHGs emissions have continued to increase since 1990. In fact GHGs emissions have increased in 2010 by a record amount that they surpassed even the worst case scenario of the IPCC report. This trend is currently not showing any signs of a slowdown, let alone reversal. 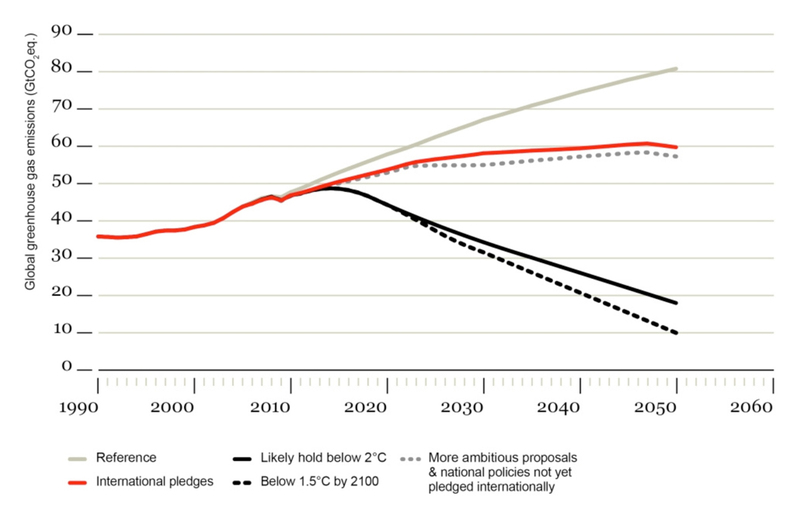 In addition, the cumulative impact of current national pledges to cut carbon emissions fall short of stopping an increase in GHG emissions by 2050, let alone cutting it by any factor (Figure 4). Furthermore, while climate change is a global challenge that requires a global response, total GHG emissions are not produced uniformly around the world, with 85% of emissions produced by the 20 largest emitting countries. This disparity in responsibility has inevitably led to friction between nations that are most responsible for climate change and those which are most affected by its impacts. To complicate things further, nations also vary greatly in their per capita emissions. China, for example, is the world’s largest emitter in absolute terms since it overtook the United States in 2006. However, on a per capita basis, China ranks much lower than the US which has one of the highest per capita emissions rates. In the Middle East, this variation is also evident. Qatar for example leads the region -and the world- with 53.47 tons of CO2e per capita per year compared to a world’s average per capita emissions of just above 5 tons. Morocco on the other hand emits a mere 1.5 tons CO2e per capita in the same period. Halving the world’s GHG emissions requires achieving a world average per capita carbon footprint of approximately 2 tons CO2e. 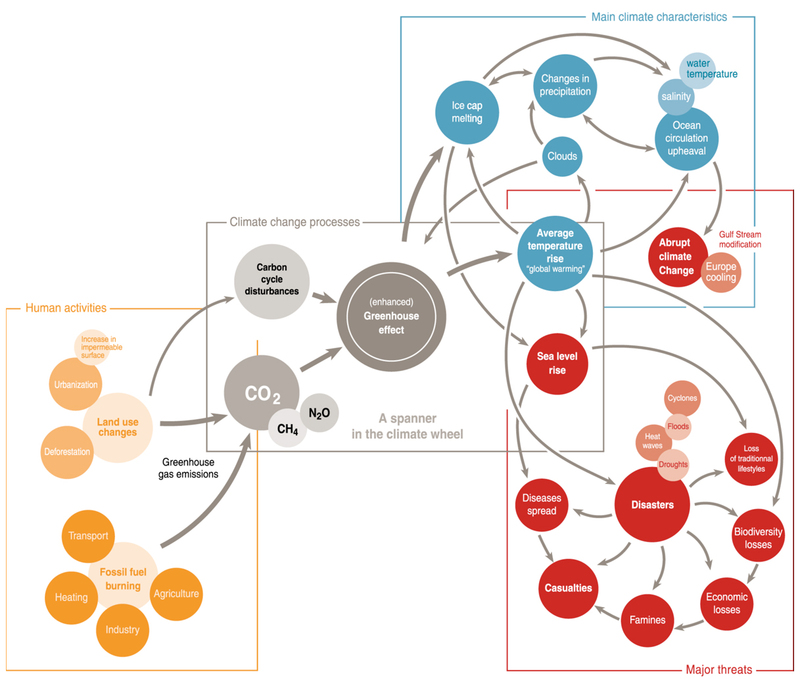 For one to develop a strategy for adapting to climate change, it’s important to understand the complex and intertwining impacts of global warming. It is estimated that increases in sea temperature will cause thermal expansion of the world’s oceans and seas. This expansion, coupled with melted land-based ice, will lead to a rise in sea levels. It is estimated that sea levels have already risen by 0.17 meters over the last century and are expected to rise further by 0.18 to 0.59 meters by the year 2100. A sea level rise of such magnitude is expected to put many cities and islands under water and to displace millions around the world. Climate change is also expected to contribute to an increased frequency and intensity of extreme weather events such as hurricanes, flood, droughts and heavy participation events. Many of these events are already being observed around the world. Events such as the heat waves in Russia, extreme cooling in Europe, hurricanes in the US, floods in Pakistan, and draught in the African horn have been linked to the impacts of climate change. Climate change is also expected to lead to adverse ecological and socio-economic impacts such as reduced agricultural production and food security, risks to human health, and reduced biodiversity. Changes to participation patterns will lead to severe water shortage in some areas and heavy floods in others. Rising temperatures will also increase the risk of diseases such as malaria as more areas become prone to such diseases. It must be said that the exact extent of these impacts cannot be accurately forecasted and will eventually depend on the actual level of warming, the interactions between the various climate systems, and the responsiveness of ecosystems to such relatively fast climate changes (Figure 5). Yet, even the currently observed impacts are serious enough to warrant a global action to mitigate climate change and avoid irreversible large scale disruptions to the Earth’s natural systems. Since then, major breakthroughs in climate negotiations took place and major commitments were made, the most significant of which is the Kyoto protocol which was negotiated in 1997 and entered into force in 2005 (figure 6). Recognizing the wide difference in historical GHG emissions across countries, parties to the Kyoto protocol agreed that they had “common but differentiated responsibilities” towards reducing their GHG emissions. In that spirit, developed countries agreed to reduce their emissions by an average of 5.2% below 1990 levels by 2008-2012, the first commitment period under the Kyoto protocol. The Kyoto protocol was a major step forward; however, the 37 developed countries with binding reduction targets under the Kyoto protocol represented only 25% of the world’s global emissions. It was clear that the world needed a new treaty that included developing countries such China, India, and Brazil, whose shares of global emissions grew significantly since the Kyoto Protocol was negotiated, as well as major players such as the United States which was not party to the Kyoto Protocol. In 2005, parties to the Kyoto protocol together with the United States agreed in Montreal to start negotiating a post-2012 emissions reduction commitment with the aim of reaching an agreement in Copenhagen in 2009. However, the outcome of Copenhagen was a true disappointment as the United States succeeded in steering the negotiations away from a legally binding emissions reduction commitment. The alternative was the Copenhagen Accord, which calls on developed countries to commit to “economy-wide emissions targets for 2020”. The targets were discretionary and non-binding, which is why the 15th Conference of Parties (COP 15) in Copenhagen was largely seen as a step backwards in climate negotiations. However, the notion of a binding emissions reduction treaty that covers all countries – developed and developing – was revived two years later in Durban’s COP 17. The 2011 conference ended a very intense and politically polarized round of negotiations with countries agreeing on reaching a legally binding agreement by 2015 which would take effect after 2020. The outcome of Durban’s COP 17 places great expectations on COP 18 in Doha which will host the first round of negotiations dedicated toward reaching the 2015 agreement. With such high hopes for event, it is our hope that the Road to Doha project by Carboun would help highlight the significance of hosting these negotiations in the region, in addition to helping build awareness of climate change impacts on the Middle East and the challenges they pose for the region.